Seattle will fix or install 22,500 curb ramps over the next 18 years to settle a federal class action lawsuit brought by three men with disabilities, according to a preliminary agreement. That’s expected to cost nearly $300 million. 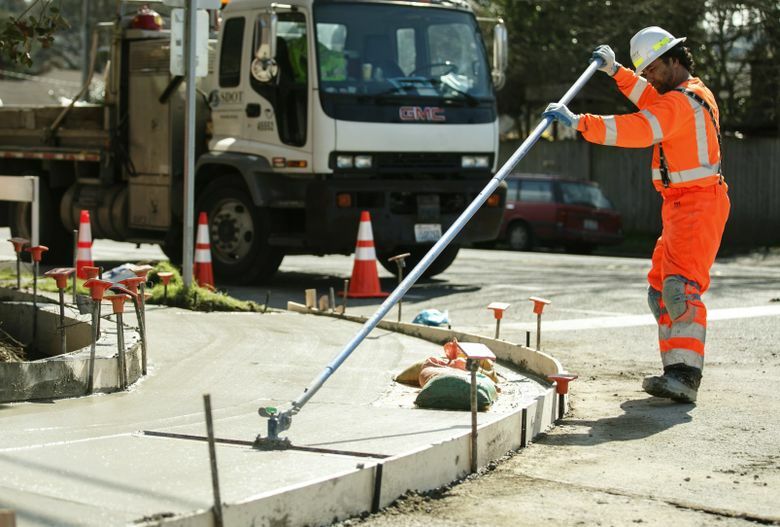 The city of Seattle agreed to build thousands of sidewalk curb ramps over the next 18 years, costing hundreds of millions of dollars, as part of a preliminary agreement to settle a federal class action lawsuit. The settlement, filed with U.S. District Court Monday evening, requires the city to build or fix 1,250 curb ramps each year for the next 18 years. That’s 22,500 curb ramps total. The costs to the city of installing curb ramps can vary widely. A city-commissioned study from 2016 estimated the cost of each curb ramp at nearly $13,100. That number yields a total cost to the city of more than $294 million over the next 18 years. Indeed, the settlement, which still must be approved by U.S. District Judge Barbara Rothstein, says “nearly $300 million will be spent” by the city and other agencies and entities on curb ramps. But when the city bids out construction projects, contractors frequently quote prices far less than $13,100 per ramp. Two recent acceptedbids quote prices for ramps ranging between $2,100 and $3,250 each, although those numbers don’t include removal of old sidewalk materials. Every curb ramp built in the city, no matter who builds it, will count toward the city’s commitment. Regardless of the total price tag, the agreement represents a significant increase in the city’s building of ramps. Linda Dardarian, an attorney for the plaintiffs, estimated that ramps will now be built three times faster than the city’s historic pace. Three men with disabilities sued Seattle in 2015, alleging the city was violating the Americans with Disabilities Act because many sidewalks lack curb ramps — needed to make crossing the street possible in a wheelchair or scooter — and many existing curb ramps are not up to snuff. The men had negotiated with the city for more than a year before filing the lawsuit. Conrad Reynoldson, a disability-rights lawyer and one of the plaintiffs, said he was “beyond thrilled” with the agreement. “It has been hard finishing up law school, setting up my practice or even getting to court when I have to figure out a way to get there that doesn’t involve me going blocks out of my way or traveling in the street due to a missing curb ramp,” Reynoldson in a statement. The agreement also requires the city to improve how it accepts complaints about ramps from disabled residents. The city agrees to make “its best efforts” to investigate curb-ramp requests within 30 days and to fix them within 12 months. “By building thousands of curb ramps we are righting a wrong that prevented people with mobility disabilities from easily moving around the city,” Mayor Ed Murray said in a statement. The city estimates there are 26,000 people in Seattle who use wheelchairs or similar devices to get around. Nearly three decades after the Americans with Disabilities Act became law, the courtroom has become an increasingly important venue for forcing cities into compliance. And while Seattle’s settlement is hardly the biggest nationwide — in 2014 Los Angeles agreed to spend nearly $1.4 billion on curb ramps — both sides of the litigation agreed it will have a big impact on people with disabilities.